BeautySwot: Batiste Dry Shampoo Wild Party Trio - Stocking Filler Idea! 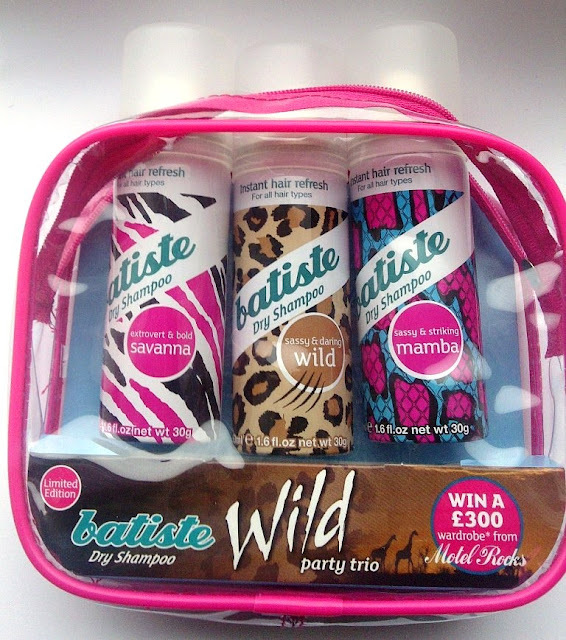 Batiste Dry Shampoo Wild Party Trio - Stocking Filler Idea! Christmas Stocking Filler, Secret Santa or just a gift for yourself to carry you through party season, Batiste Wild Party Trio fits the bill. All contained in a see-through reusable toilet bag. My favourite of the scents is Savanna but actually they are all great and do a wonderful job of reviving hair. Plus inside packs is a voucher for 20% off at fashion retailer Motel Rocks and one person has the chance to win £300 towards a new wardroble. See pack for details.